Researchers at the University of Maine have developed a lightweight composite bridge that is twice as strong as steel and concrete bridge girders. 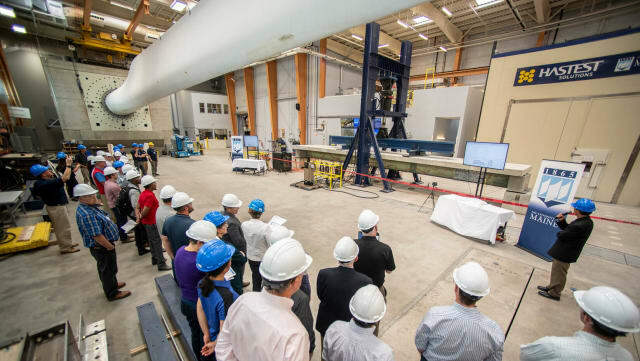 In a mid-July demonstration, the university’s Advanced Structures and Composites Center tested a 21-foot span of the composite with computer-controlled hydraulic equipment that can simulate the weight of highway traffic. The test was necessary to ensure that the bridge passed American Association of State Highway and Transportation Officials (AASHTO) Bridge Design Specifications, and it succeeded with flying colours. The test came a little over a month after the US Department of Transportation announced that they would grant UMaine up to $14.2 million to lead a push to improve the durability of New England’s transportation infrastructure. And it looks like the bridge will stand up to the challenge. According to the team, the girders are designed to last for up to 100 years, and the panels are relatively easy to replace. “The unique connection system we’ve developed allows you to come in 50 years later, essentially pull the deck out and then put the new deck on without having to jackhammer the concrete deck like you typically would,” Dagher said. The Center is also responsible for the famous Bridge-In-A-Backpack, a lightweight FRP composite structure to reinforce arch bridges. And Advanced Infrastructure Technologies, the company that licensed Bridge-in-a-Backpack, is looking forward to licencing the new composite after another round of trials in August.